Janie Guimond is a Canadian volleyball player born in Trois-Rivieres, QC. She began playing volleyball at the age of 14, simply so she could stay active and share a sport with her close friends. What started as a leisurely sport turned into a passion for Janie, one which has brought her to many international competitions playing for Team Canada. One of Janie’s favourite parts of the sport is the adaptability that is required in playing at a high level, a skill and style of play that has helped her (at 5’4) become widely recognized as one of the most talented liberos in Canada. Her favourite competition, she says, was the 2015 Pan Am Games in Toronto, where the atmosphere and prestige – and the fact that several family members were in attendance – made it the experience of a lifetime. 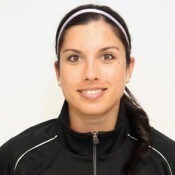 Janie holds a degree in Occupational Therapy from the University of Montréal, a field in which she hopes to continue working after her volleyball career. She currently lives in Winnipeg, MB, and outside of sport, Janie’s biggest wish is to have a family.